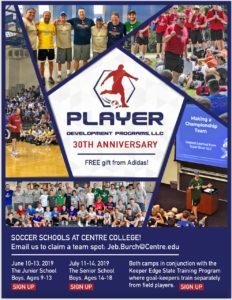 Check out our new 30th Anniversary flyer as we get ready for a great summer of soccer camps at Centre College. All players who join us this summer will receive a free gift from ADIDAS in celebration of our 30 years! Tell your friends and come join us for what promises to be a fun summer of soccer!